Archaeology Magazine, which until now has been able to remain focused on the science of archaeology, has now succumbed to popular scaremongering (Andrew Curry: “Climate Change: Sites in Peril”, Archaeology, March/April 2009 http://www.archaeology.org/0903/etc/climate_change.html ). The IPCC does not make the claims stated in the Archaeology magazine introduction. First of all, the IPCC claims that CO2 affects temperatures only since 1970. The following figure is from the IPCC AR4, with global temperatures superimposed. It shows the output of multiple runs of multiple climate models: blue band – using only natural climate forcings, and pink band – including anthropogenic CO2. One thing that is clear is that the models only require the inclusion of CO2 after 1970. In other words, according to the IPCC, warming prior to 1970 can be explained by natural causes. This is an important point since many people are mislead into thinking that the official IPCC position attributes the 20th century warming to CO2, which is not the case. Secondly, the projections of future warming under various scenarios have as the highest probability case, a warming of less than 2 degrees over the next century. 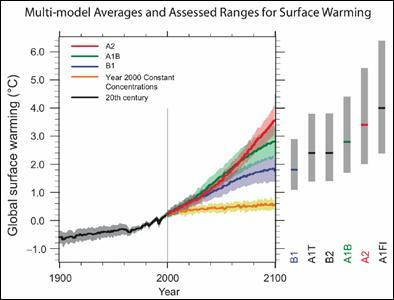 The following figure is from the IPCC AR4 showing outputs of climate models for various future scenarios. It does not show the probability levels, but even at its most extreme case comes nowhere near the 10 degrees as claimed in the article. The Intergovernmental Panel on Climate Change (IPCC) was founded in 1988 by the United Nations Environment Program and the World Meteorological Organization, with the purpose of assessing “the scientific, technical and socioeconomic information relevant for the understanding of the risk of human-induced climate change.” In other words the organization is built on the a priori assumption of “human-induced climate change” [http://www.appinsys.com/GlobalWarming/GW_Part7_PoliticalConsensus.htm]. The IPCC is political in nature. “Its key document, “Summary for Policymakers,” is written by a committee composed mostly of representatives of governments and advocacy groups. Few scientists have a role in crafting that paper, which is all that most policy-makers read.” [http://popecenter.org/commentaries/article.html?id=2139] (Also see, Richard Lindzen, Professor of Meteorology at MIT: http://ecoworld.com/features/2008/10/30/climate-science-is-it-currently-designed-to-answer-questions/ for a discussion of the politicization of climate science and the IPCC). The following sections address the actual climate data for each of the focus items in the Archeology Magazine article. The problem is mainly conflation of localized conditions with a hypothetical anthropogenic CO2 based cause of global warming. The focus is on burial mounds (kurgans) – frozen tombs threatened by melting permafrost. NOAA maintains a database of global temperature stations (the Global Historical Climate Network – GHCN). There are no long-term temperature stations in the region. The only station in the GHCN database with data going back as far as the early 1950’s is Altay. 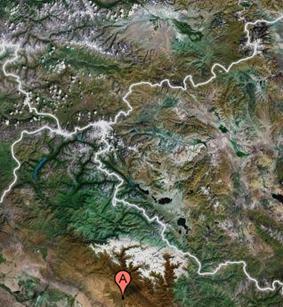 The following images show: location of Altai Mountains (left) and location of Altay temperature station (center, marked with A on red symbol) and major kurgan sites (right). The following figures show January/February mean temperature (leftt) and the July/August mean temperature for Altay. 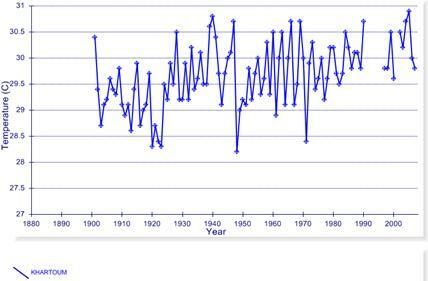 Warming is evident in the January/February mean until the year 1980 The although there is no warming trend since then. The July/August mean shows a slight cooling trend. The following figure shows the monthly mean temperature (blue) along with the January mean temperature (red). There is no trend evident in either the summer or winter temperatures. Poor data recording is evident from the mid-1990s to the early 2000s. 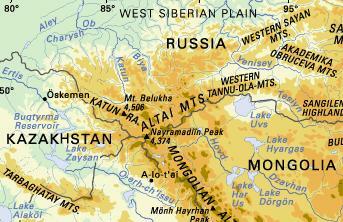 The Archeology Magazine article states: “The glaciers that covered the slopes of the Altai are receding and even disappearing.” This is similar to glaciers throughout most of the world – they have been receding since the Little Ice Age in the 1700s. The following figure shows the recession of the two largest glaciers in the Altai [http://homepages.vub.ac.be/~fpattyn/papers/Pattyn2003_Ann37.pdf]. They have been disappearing since before recording of their position began in the late 1800s – early 1900s. For the largest glacier, the rate of recession has actually slowed down. Since according to the IPCC, anthropogenic CO2 has only caused warming since 1970, the recession of the glaciers cannot be due to CO2-induced global warming. Also, since January temperatures have not been increasing since the 1970s, this cannot be attributed to anthropogenic CO2-induced global warming. So, from 1200 – 1400 the Altai was “warmer and more humid than present” and the current warming period has been occurring since the early 1800s, since the Little Ice Age. 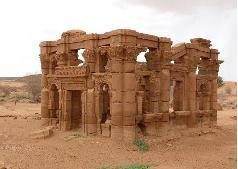 The focus is on ruins threatened by heavy rainfall. This one attributes the heavy rainfall of 1998 to the severe El Nino of that year. Although there is no known connection between El Nino and anthropogenic CO2 global warming, the author chose to conflate the phenomena. 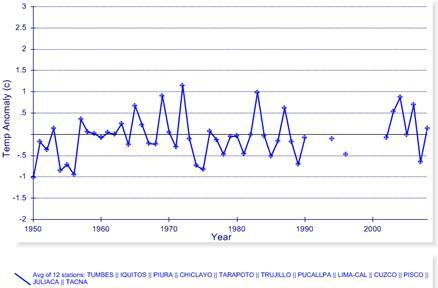 The following figure shows the annual mean temperature for the average of all 12 “long-term” stations in Peru (in this case unfortunately not actually long-term, but since 1950) stations in the NOAA GHCN database. No warming trend. The article mentions Chan Chan as an archaeological site threatened by erosion due to precipitation. 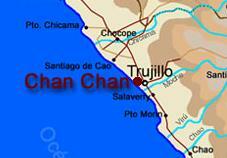 Chan Chan is 5 km from Trujillo. Unfortunately there is a lot of missing data in the NOAA GHCN records for Peruvian stations. The following figure shows total annual precipitation for Trujillo – the closest station to Chan Chan. The following figure shows the estimated solar output reaching the earth (upper figure) [http://www.giss.nasa.gov/research/briefs/shindell_03/] as well as the same plot (changed to green) superimposed on the El Nino / Southern Oscillation (ENSO) [http://www.cdc.noaa.gov/people/klaus.wolter/MEI/]. 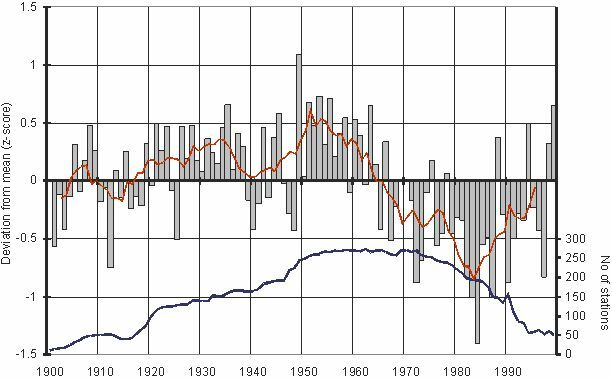 The declining solar irradiance from 1958 to 1975 corresponds to a general decreasing trend in the ENSO, followed by a shift to mainly positive values following the Pacific climate shift of 1976/77. The solar – El Nino connection is stronger than any evidence based on CO2. 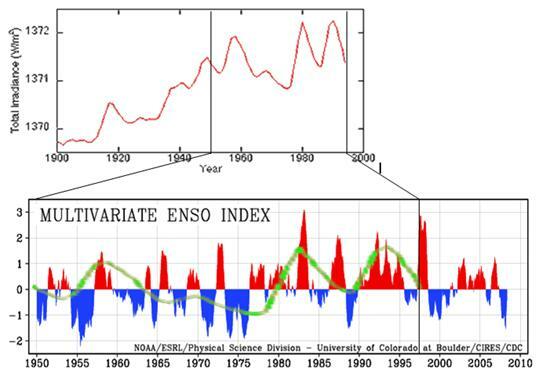 See http://www.appinsys.com/GlobalWarming/ENSO.htm for more information about El Nino. While these types of ruins are being deteriorated by rainfall, it is misleading for the author to conflate the El Nino phenomenon with anthropogenic CO2 based global warming, since there is no scientific basis for doing so. One of the leading proponents of belief in anthropogenic CO2 – Kevin Trenberth says [http://www.ucar.edu/communications/quarterly/winter97/connection.html] : “We would normally use models to pin down what the effects would be, however the models we have are not really good enough to answer our questions … But even though we can't trace the link between the changes in ENSO and NAO and global warming, Trenberth believes, "There's got to be a connection”. This is what it comes down to – belief. 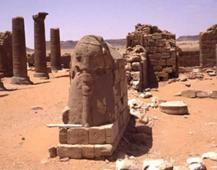 The focus is on ruins threatened by blowing sand. This one attributes the sand to global warming. One of the main focus locations of the article is al Musawarat. The following figures show: left – location of Musawarat maked with the blue A, and two photographs of ruins at the location. Khartoum is the closest station in the NOAA GHCN database (and the only one with long-term data). 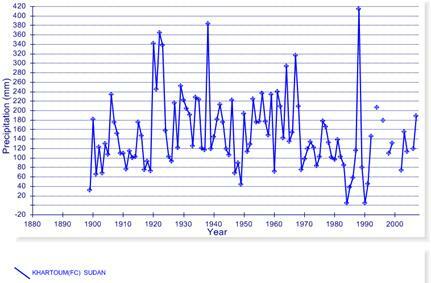 The following figures show the average annual temperature in Khartoum (left) and total annual precipitation (right). The area has experienced warming over the last few decades as well as low precipitation, although the precipitation is recovering since the 1980s. The rainfall in the edge of the Shara desert (the Sahel) is known to be related to the Atlantic Multidecadal Oscillation (AMO). 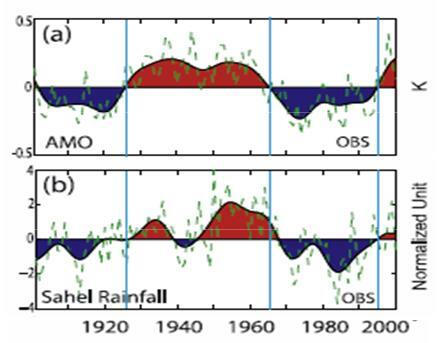 The following figure is from a study (Zhang and Delwoth, “Impact of Atlantic Multidecadal Oscillations on India/Sahel Rainfall and Atlantic Hurricanes”, Geophysical Research Letters, Vol. 33, 2006) [http://www.gfdl.noaa.gov/reference/bibliography/2006/roz0603.pdf] showing the correspondence between the AMO (a) and the Sahel rainfall (b). See www.appinsys.com/GlobalWarming/PDO_AMO.htm for more information on the AMO. Since the lowest point in the rainfall in the 1980s, the vegetation has been increasing in the Sahel. The following figure shows the Normalized Difference Vegetation Index (NDVI), showing substantial increases throughout most of the region. [http://www.eoearth.org/article/Greening_of_the_Sahel]. · The most serious concerns are land degradation, desertification and the spread of deserts southwards by an average of 100km over the past four decades. These are linked with factors including overgrazing of fragile soils by a livestock population that has exploded from close to 27 million animals to around 135 million now. Many sensitive areas are also experiencing a "deforestation crisis" which has led to a loss of almost 12 per cent of Sudan's forest cover in just 15 years. Indeed, some areas may undergo a total loss of forest cover within the next decade. · The crisis is being aggravated by degradation of water sources in deserts known as wadis or oases. "Virtually all such areas inspected by UNEP were found to be moderately to severely degraded, principally due to deforestation, overgrazing and erosion,"
· The most devastating floods occur on the Blue Nile, as a result of deforestation and overgrazing in the river's upper catchment. Riverbank erosion due to watershed degradation and associated flooding is particularly destructive and severe along the fertile Nile riverine strip. · The environmental impacts of many of the camps is high, especially in respect to deforestation for fuel wood. 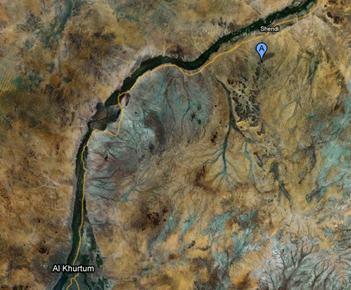 The UNEP study found that in Darfur, extensive deforestation can be found as far as 10km from a camp. The situation is being aggravated by brick making in some camps. · "At the regional level, two-thirds of the forests in north, central and eastern Sudan disappeared between 1972 and 2001. In Darfur, a third of the forest cover was lost between 1973 and 2006. Southern Sudan is estimated to have lost 40 per cent of its forests since independence and deforestation is ongoing," This is largely driven by slash and burn agriculture and energy demands. The focus is on glaciers in the European Alps receding and exposing archaeological finds. 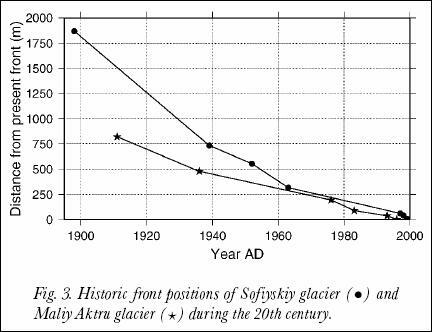 This one attributes the receding glaciers to global warming, and is amusing since the fact that archaeological finds are being exposed indicates the glaciers weren’t there when the artifacts were left. The following figure is from a study of 169 receding glaciers worldwide (Johannes Oerlemans, “Extracting a Climate Signal from 169 Glacier Records”, published in Science, 2005). 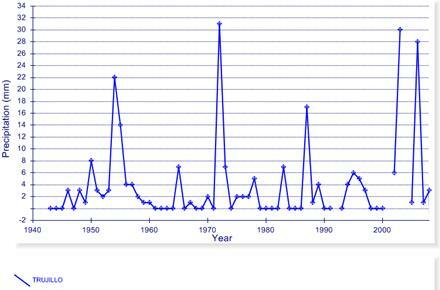 It shows the composite average of up to 169 glaciers (the number varies in different time periods). These indicate the pattern that is consistent for most glaciers worldwide – the recession of the glaciers started at the end of the Little Ice Age in the 1700s. 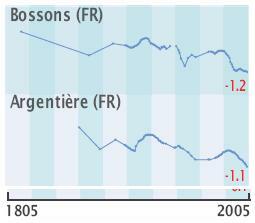 The following figures show glacier recession for several glaciers in the Austrian Alps (left) and French Alps (right) [http://www.grid.unep.ch/glaciers/pdfs/6_5.pdf] showing fluctuating glacial retreat since the 1800s. The following figure shows the number of advancing glaciers (blue) and retreating glaciers (red) for Central Europe [http://www.grid.unep.ch/glaciers/pdfs/5.pdf]. The figure refers to the Little Ice Age maximum glacier extents in the mid-1800s. 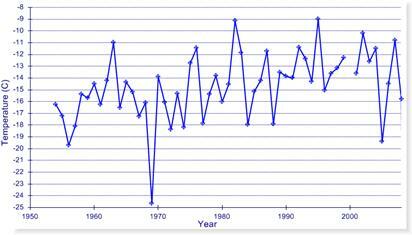 The recession of glaciers started long before the 1970s when the IPCC attributes warming to anthropogenic CO2. The focus is on rising sea levels around the Channel Islands off the coast of California threatening coastal rock shelters. According to the article: “early Americans were good sailors who reached the islands more than 13,000 years ago. … Back then the … oceans much lower – low enough that four of the Channel Islands were connected by dry land. Now, rising sea levels are threatening some of the last coastal rock shelters”. Interesting how it is “now rising sea levels” even though thousands of years of rising sea levels are implicated by the complete statement. 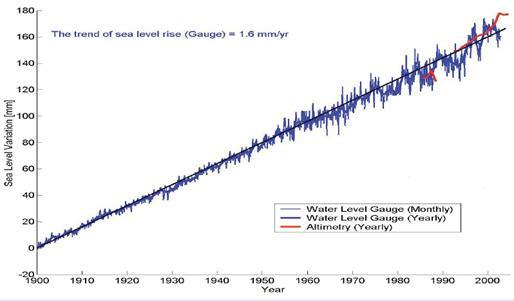 In other words the rising sea level is not simply a recent phenomenon. The following figure shows global cumulative sea level change for 1900 to 2002 [http://www.wamis.org/agm/meetings/rsama08/S304-Shum_Global_Sea_Level_Rise.pdf]. 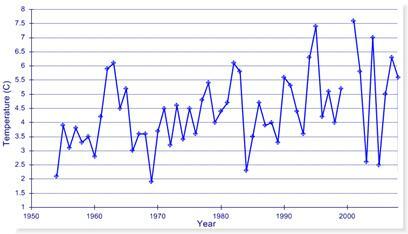 Since according to the IPCC, CO2-based warming has apparently only shown up since the 1970s, all of this sea level rise since prior to 1970 cannot be caused by anthropogenic CO2, and yet the trend has not increased. The following figure shows sea levels for the closest stations to the Channel Islands in the NOAA database [http://tidesandcurrents.noaa.gov/sltrends/index.shtml] Los Angeles has the longest record in the area and for the last 85 years has risen at an average of 0.83 mm / year (= 3.25 inches per century). The IPCC stated in the Third Assessment Report (2001) [http://www.grida.no/climate/ipcc_tar/wg1/425.htm]: “There is no evidence for any acceleration of sea level rise in data from the 20th century data”. So it’s not caused by anthropogenic CO2. The focus is on storm surges around Greenland’s north and eastern coast, which can then reach the coast and damage Thule buildings from when they migrated to Greenland 2,000 years ago. The following figures show the temperature anomalies for the available long-term or recent stations in Greenland (from the NOAA GHCN database) – left: individual stations, right: average of the 8 stations. 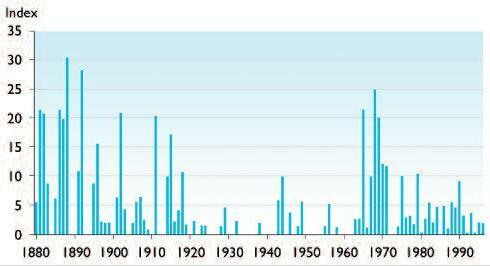 Temperatures are recently matching those observed in the 1930’s. 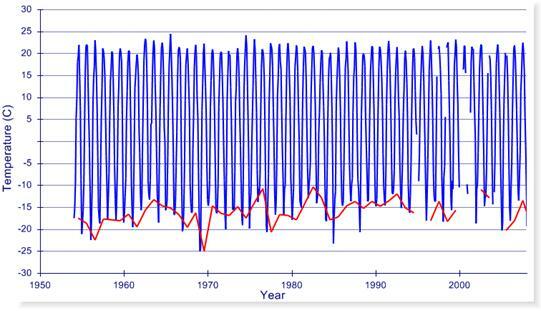 The next figure compares the average anomalies with the Atlantic Multidecadal Oscillation (AMO). 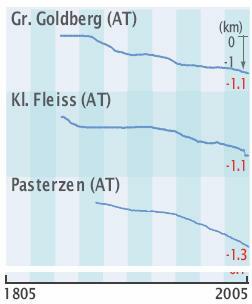 This shows the effect of the AMO on Greenland temperatures. (See www.appinsys.com/GlobalWarming/PDO_AMO.htm for more information on the AMO). The following figure shows the Icelandic sea ice index [http://www.eoearth.org/article/Sea_ice_in_the_Arctic]. Recent declines are not unprecedented. The Archaeology magazine article recounts: “I’ve been working in Greenland for 30 years now. I can see with my own eyes how it has changed”. The problem with anecdotes is that they are not science. 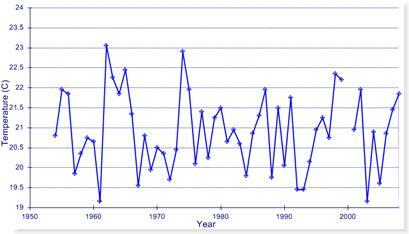 Climate is defined as average weather over 30 years. Had this person been working in Greenland for 100 years, his story would be different. Short term data do not show long-term trends. The following figure shows the Icelandic sea ice index from a 2005 report by the Danish Meteorological Institute (“Multi-decadal variation of the East Greenland Sea-Ice Extent: AD 1500-2000”) [http://www.dmi.dk/dmi/sr05-02.pdf]. Anthropogenic CO2 causing this? Better stick with archaeology Andrew.